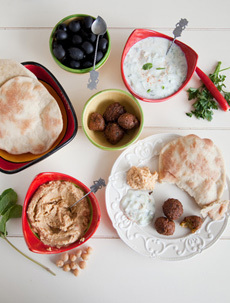 Mezze (Arabic for appetizers) are more than mezze: They’re a lunch or dinner buffet. Photo © Simone van den Berg | Fotolia. First developed as a “meaty” meatless option for early Egyptian Christians (today’s Copts), falafel was made from the country’s plentiful fava bean crop. 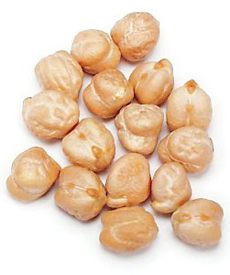 As the recipe moved northward to the Levant (modern-day Israel, Jordan, Lebanon, the Palestinian Territories and Syria), the more abundant chickpeas (garbanzo beans) were used. Try it with all chickpeas or all fava beans. Use all parsley or all cilantro. Add more coriander and cumin. The falafel, tahini and garlic sauce recipes are courtesy Denise “Dede” Hazime. Dede grew up in a large Lebanese family with a mother who shared her love of cooking. When Dede moved from Michigan to California, she found a dearth of Middle Eastern restaurants. With the help of her husband, she launched DedeMed.com in 2007, full of recipes and videos showcasing the foods she grew up with. After attracting a large following, she opened DedeMed’s Shawarma House on the Camp Pendleton Marine base, a huge hit with the troops who had enjoyed the cuisine while deployed in the Middle East. Watch Dede prepare falafel from scratch in this video. Don’t use canned chickpeas. They are too wet; your falafel will fall apart. Plus, canned beans are loaded with salt and preservatives. You can make the recipe in advance. Bring the refrigerated mixture to room temperature before cooking. You can freeze the unused, uncooked mixture. Use canola oil to fry: It’s a heart-healthy, monounsaturated fat. When making falafel, it’s important to use dried garbanzo beans instead of canned. Photo courtesy Angelina’s Gourmet. Soak the garbanzo beans and fava beans in water overnight. Drain. Chop and blend first the garbanzo beans, then the fava beans in a food processor until the beans are the consistency of fine bread crumbs. Place in a large bowl. In the bowl of a blender, add the onion, garlic, cilantro and parsley and blend to a paste consistency. Add to bean mixture. Next add the cumin, coriander, salt, black pepper, bread crumbs and cayenne, mixing very well. Taste to see if you want to adjust the salt or other seasonings. Add the baking soda and baking powder to the bean mixture about 15 minutes before frying and mix well. Heat 1 inch of vegetable oil in a 2 to 3 inch frying pan. Turn to medium-low heat. Mold the falafel mixture into small balls and drop into oil to fry (some people make falafel the size of ping pong balls, some make them smaller, others make them flatter, like patties). Continually turn the falafel to keep the color an even brown on all sides. When they are a medium brown color, remove the falafel and drain on a paper towel for a minute. Serve warm and fresh with tahini sauce, pickled turnips, pita bread and other sides. For one cup of bread crumbs, crumble day-old (or older) gluten-free bread onto a cookie sheet (the older it is, the easier it crumbles; stale bread is fine). Toast at 200°F for an hour, stirring the crumbs with a wooden spoon every 20 minutes. Let stand in the oven until cool, several hours or overnight. You can pulse the crumbs in your blender or food processor for a finer consistency. Place in an airtight container. Store leftover breadcrumbs in the freezer. If you want to save some calories, bake your falafel instead of frying it. Oil a shallow baking dish with olive oil. Add the falafel to the dish and bake for 15 minutes on each side, until the sides touching the pan are golden brown. Oven temperatures vary, so check on the color after 10 minutes. Lifestyle Direct, Inc. All rights reserved.